This is a sponsored post written by me on behalf of Campbell’s Soup Company. You will need a large snowflake shaped cookie cutter for this. On a large cutting board, assemble each of your grilled cheese sandwiches. Place one slice of cheese between 2 slices of bread. Do this to make 4 sandwiches. Roll each of the sandwiches out slightly with a rolling pin. (This is a fun task to let the kids help with.) Butter each side of the rolled out sandwiches. Rolling out the sandwiches creates more space to use the snowflake cookie cutter with later. Heat a medium skillet over medium heat. Once heated, add the grilled cheese sandwiches two at a time. Cook each side until golden brown & crispy, about 1-2 minutes each side. Remove from pan and place back on the cutting board. Allow the sandwiches to rest for a few minutes before cutting them with the cookie cutter. 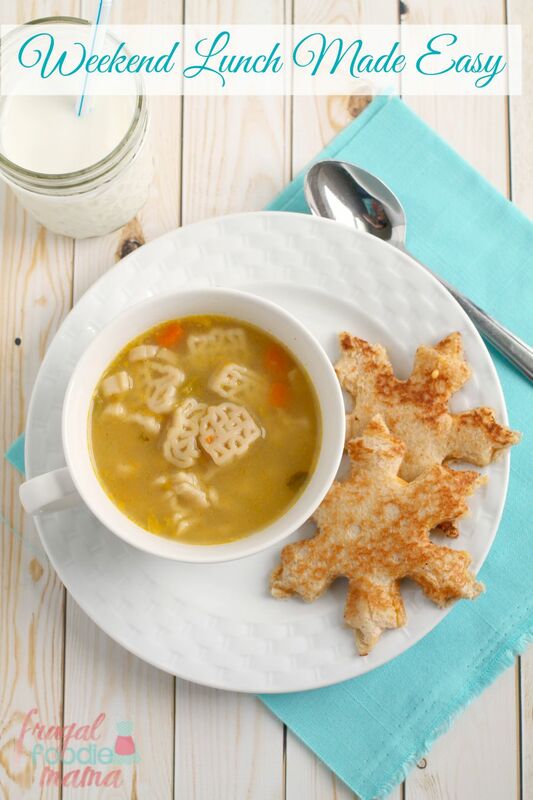 You want the melted cheese to set back up slightly so it doesn't ooze out when you cut them into snowflake shapes. Cut each sandwich into a large snowflake using your cookie cutter. (You can save the scraps to snack on later.) 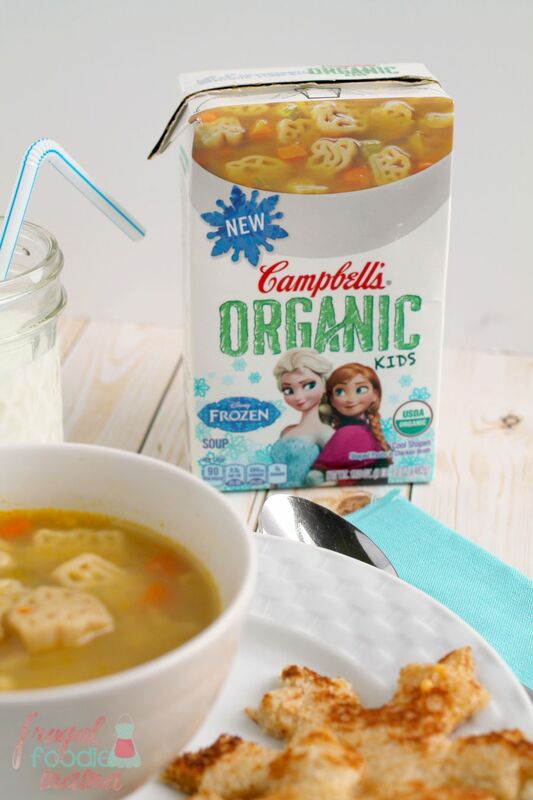 Heat the Campbell’s® Organic Kids Soup according to the package directions. Once heated ladle into 2 bowls and serve each bowl with 2 snowflake grilled cheese sandwiches. 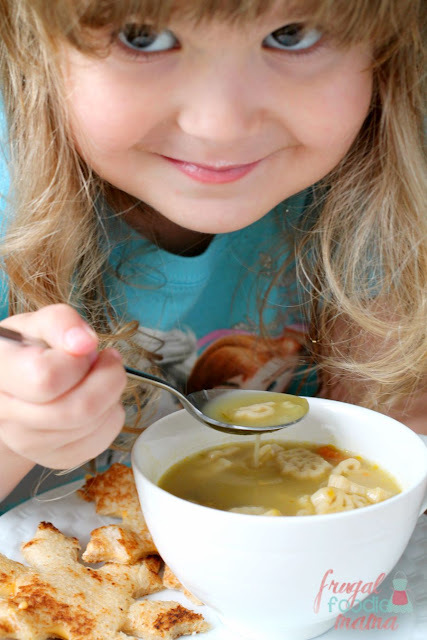 Campbell’s® soups happen to have been a staple of many of my own childhood lunches growing up, so I love that I can serve a familiar favorite to my own kids. But only now this favorite soup from my childhood is made from well grown, well made ingredients and is free from preservatives. 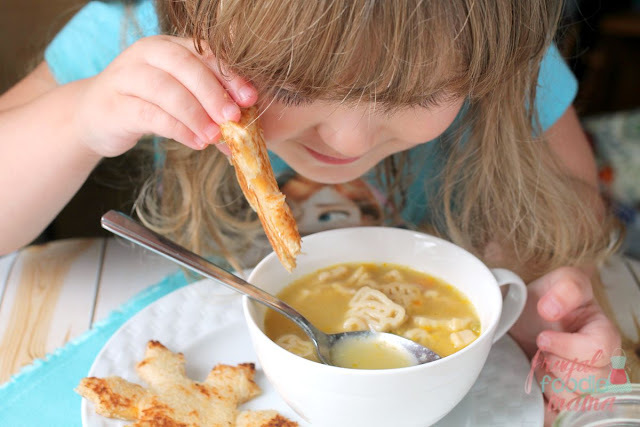 How do you make lunches on the weekend fun and fuss free?